Linen covered blue boards, Front board attached but loose.266pp+1 page for notes. 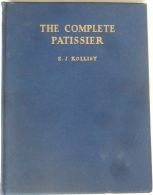 Very clean copy.Covers all aspects of the work of the Pastry Chef. Includes 12 Full Colour plates and liberally interspersed with black and white.This is a heavy book so an additional postal charge may apply. (Any digital image available on request).